ST. JOHN'S, N.L. - Canadian artists, writers and musicians ranging from Hey Rosetta to novelist Joseph Boyden are pushing for action to protect Gros Morne National Park in western Newfoundland. They've signed an open letter to Prime Minister Stephen Harper and Premier Paul Davis urging a buffer zone to prevent hydraulic fracturing and other development near the UNESCO world heritage site. Gros Morne received that designation from the United Nations in 1987 and draws thousands of visitors each year. Its famous hiking trails wind through thick forests and across stunning clifftop views over glacier-cut fjords. Its 1,800 square kilometres also feature geological wonders such as the Tablelands that have helped scientists understand how the Earth's outer shell has shifted over millions of years. "Gros Morne National Park is one of the national treasures that make us proud to be Canadians," says the letter dated Jan. 5 and publicly released Monday. "We were shocked, therefore, to learn about a proposal in 2013 to conduct oil drilling and hydraulic fracturing (fracking) activities next to the park, considering the threat that this would pose to its ecosystems, its pristine natural beauty, and the thriving local tourism economy." 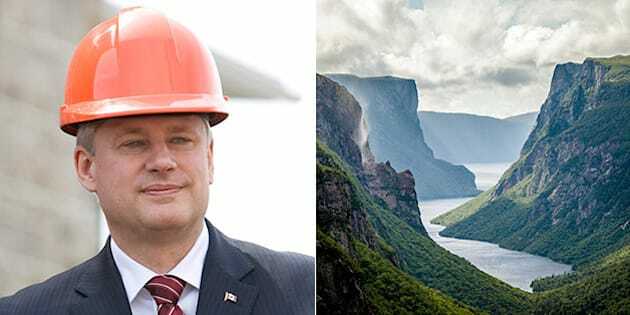 The letter urges Harper and Davis to help create a buffer zone around Gros Morne "that will be kept permanently free from industrialization." Its 32 signatures include those of astronaut Roberta Bondar, writer Lawrence Hill of "The Book of Negroes," musician Tim Baker of Hey Rosetta and actor Greg Malone of "Codco." The letter is copied to the UNESCO World Heritage Committee. It recommended last June that the federal government create a permanent protective zone around the park. Neither the Prime Minister's Office nor the premier responded to requests for comment. The province announced in November 2013 a temporary halt to potential fracking applications while it internally reviewed regulations and potential impacts. While the government had received no formal proposals to frack wells, exploration licences granted in what's known as the Green Point shale near Gros Morne touched off intense debate. Many residents raised concerns about groundwater pollution and other risks. Hydraulic fracturing or fracking pumps massive volumes of water combined with nitrogen, sand and chemicals at high pressure to shatter shale rock, allowing gas or oil to flow through well bores to the surface. It's believed Newfoundland's west coast has deep shale formations that hold potentially huge reserves of oil, unlike more shallow coalbed gas deposits in western Canada and parts of the U.S. The provincial Progressive Conservative government has stressed it puts health and environmental safety first but wants a balanced approach to industrial development. Groups such as the Newfoundland and Labrador Oil and Gas Industries Association say thousands of wells have been fracked in western Canada without environmental damage. But the Council of Canadians and other critics warn a lack of independent research and baseline measurements before and after fracking cast doubt on any safety assurances. Last October, the province named a five-member external panel with environment, geology, engineering and public health expertise to report within a year on the implications of fracking in western Newfoundland. Eric Hebert-Daly, executive director of the watchdog group Canadian Parks and Wilderness Society, helped co-ordinate the open letter as part of a broader campaign for a Gros Morne buffer. The park's coveted UNESCO status depends in part on its preservation, he said in an interview. "This seems like a no-brainer. We really just need to find the time and the effort on the part of both governments to find the solution to what that buffer zone needs to look like, and get on with it." Malone said Gros Morne is a place like no other, especially as development erodes what remains of the globe's wilderness. "Encroaching on the very few areas we have preserved as outstanding examples of the natural world is just, in my view, unacceptable greed," he said in an interview. "We don't need to do that." — Follow @suebailey on Twitter.